Our last day in Northern Ireland. Our ferry to Liverpool didn’t leave until 10:30 in the evening for an overnight sailing, so we took the opportunity to visit Belfast. 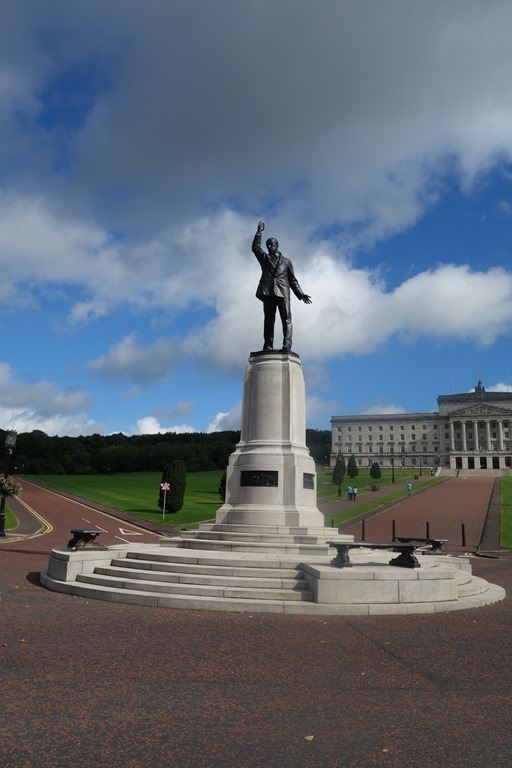 Driving into the city we passed Stormont, the home of the Northern Irish Assembly and decided to stop to take a look. We parked by the entrance to the estate, at the bottom of the mile long, tree lined, Prince of Wales Avenue which runs from the Upper Newtownards Road to the Parliament Buildings. We walked up the avenue right up to the foot of the steps of the building, passing the statue of Lord (Edward) Carson by L.S. Merrifield. Carson was leader of the Irish Unionist Alliance and Ulster Unionist Party between 1910 and 1921,and led opposition to Home Rule for Ireland. The statue was financed by public subscription and unveiled in June 1933. It’s an impressive building, completed in 1932. The architect was Sir Arnold Thornely, who was based in Liverpool. 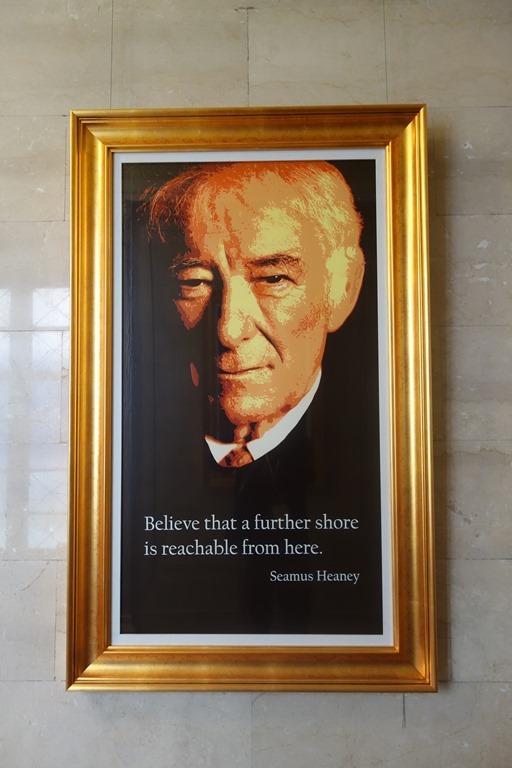 He designed the building with perfect symmetry and symbolism, such as the building being 365ft wide representing one foot for every day of the year; having six floors and six pillars at the entrance, one for each county in Northern Ireland. 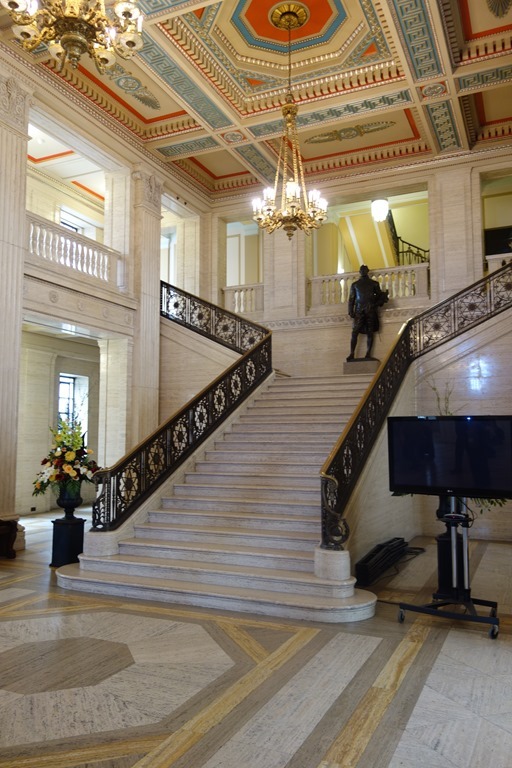 It originally was home to the Parliament of Northern Ireland which was created under the Government of Ireland Act 1920, after 6 of the counties of the Irish province of Ulster had voted to remain part of the United Kingdom when Ireland was given independence from British rule. The Parliament was dissolved with the imposition of direct rule from Westminster March 1972 at the height of “the Troubles”. It was also home to the short-lived Sunningdale power-sharing executive in 1974. 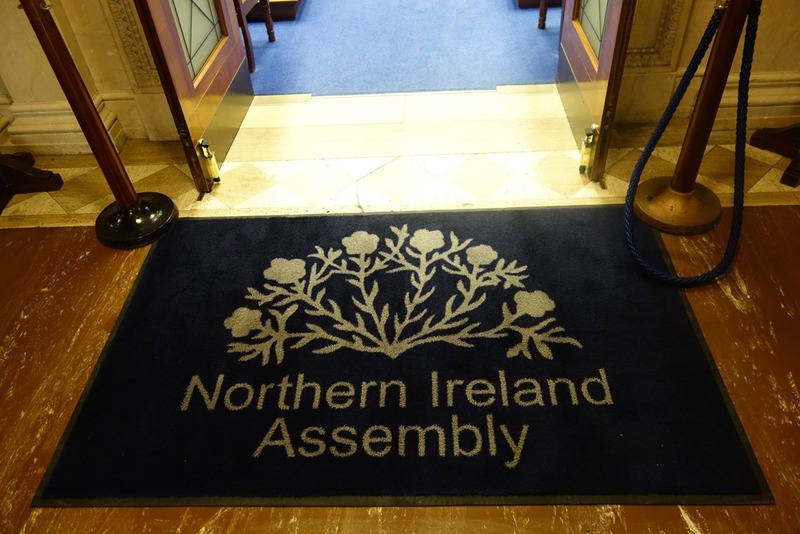 Following the Good Friday Agreement, signed on 10 April 1998, a new single chamber Northern Irish Assembly was established. 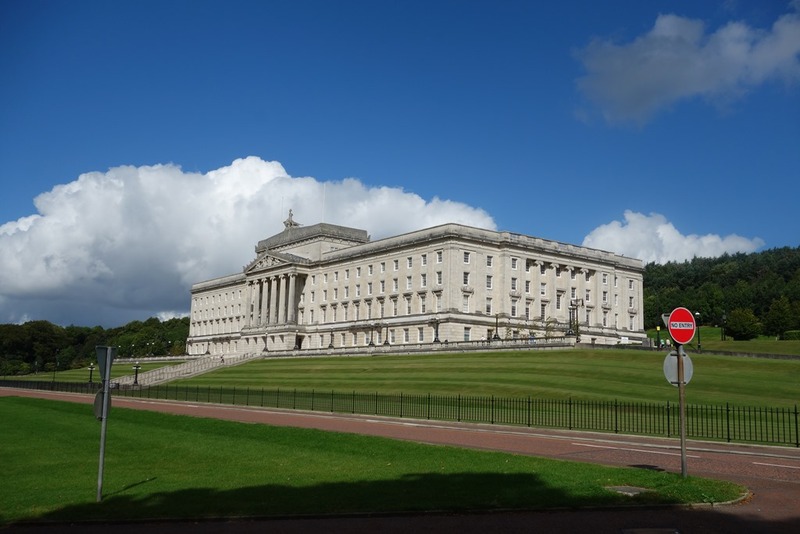 Elections were held on 25 June 1998 and the New Northern Ireland Assembly met for the first time on 1 July 1998 . 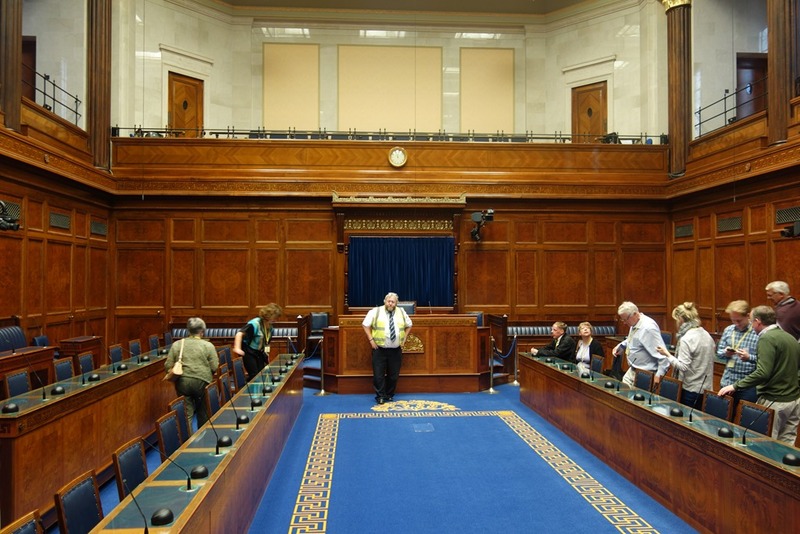 Politics are complicated in Northern Ireland and the new Assembly was suspended in October 2002 but after negotiations it was restored on 26 March 2007. Today, the Assembly is responsible for making laws on transferred matters in Northern Ireland and for scrutinising the work of Ministers and Government Departments. 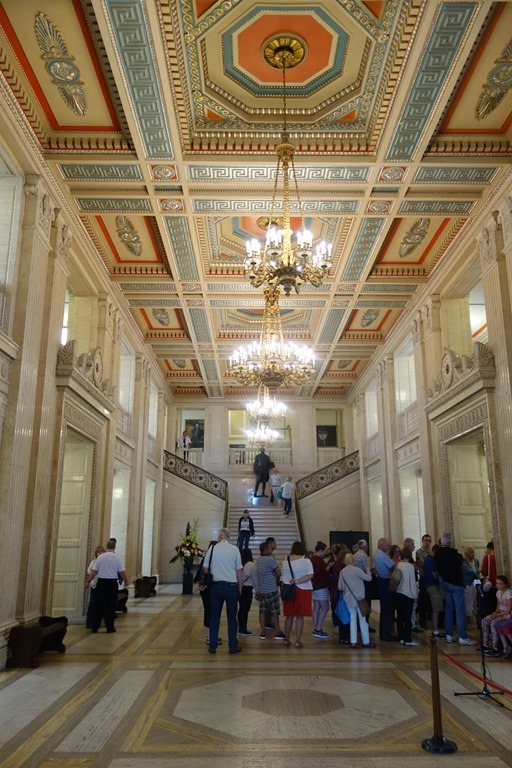 There are free guided tours of the building Monday to Friday at 11.00am and 2.00pm and during Summer recess tours are available every hour on the hour from 11:00am to 3:00pm. So we decided to to take advantage of this. 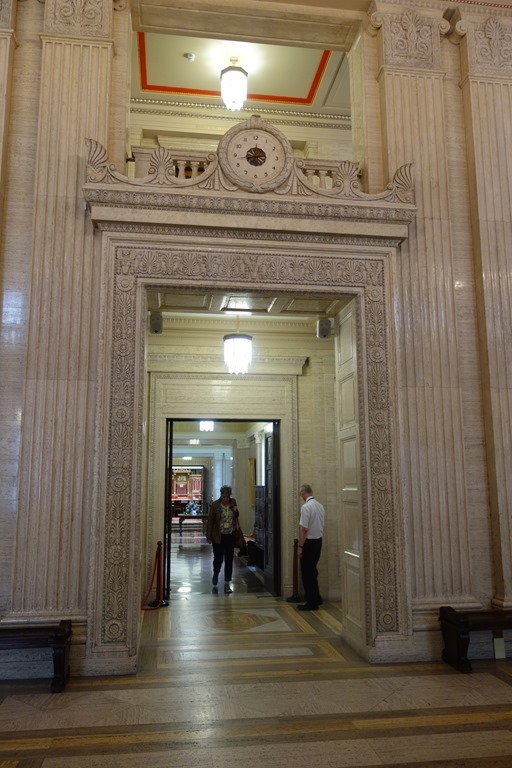 After passing through security we walked round to the front entrance of the building and entered the Great Hall which is clad in Italian travertine marble. We met up with our tour guide who gave us a history of the building and pointed out some key features of the hall. 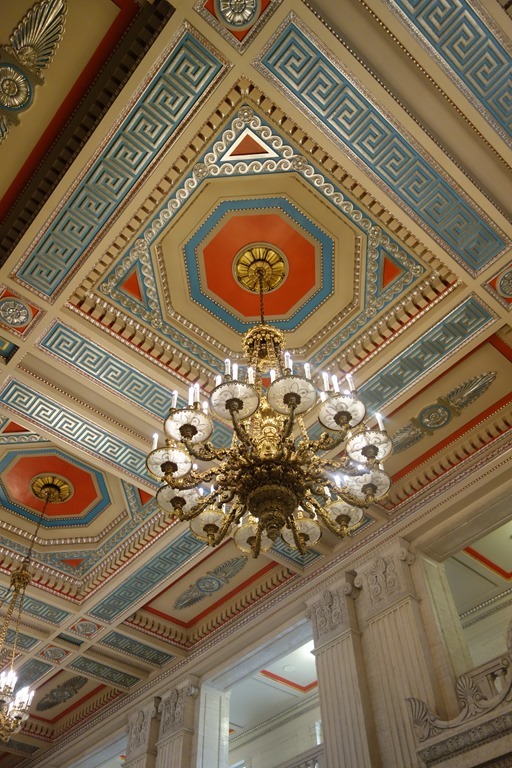 For example he told us that the very grand blue, red and gold painted ceiling of the Great Hall hasn’t been touched since it was first painted in 1932 as a special paint, formulated by Heaton, Tabb & Co. of London, was used. Hanging from the ceiling is a grand chandelier, originally hung in Windsor Castle, where it had been a gift of Kaiser Wilhelm II of Germany. It had been sent to Belfast for safe keeping during WW1 and it had never been returned! Two smaller versions, produced in the Harland and Woolf shipyards, hang to either side. 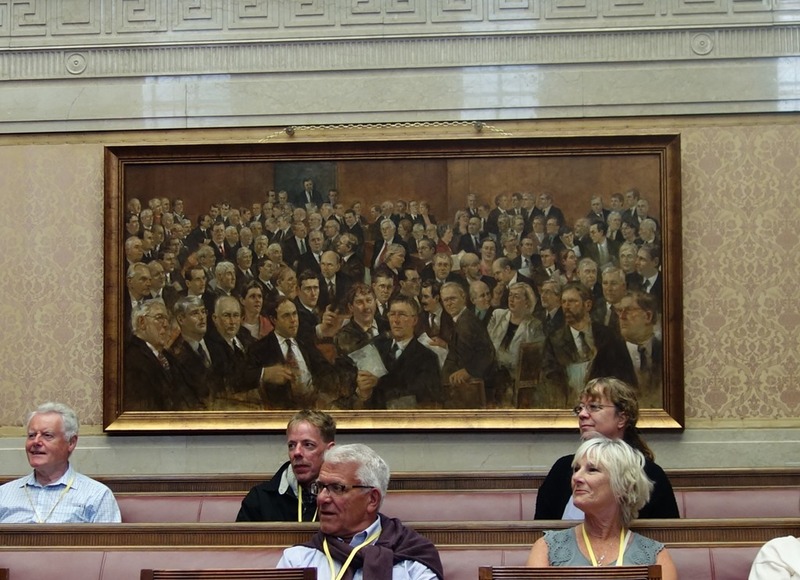 Each portrait bears a famous quotation from the respective writers which have particular relevance to the Northern Irish peace process. We then moved into the Senate chamber itself, with its red leather adversarial seats in two parallel blocks of benches remains as it was originally designed. 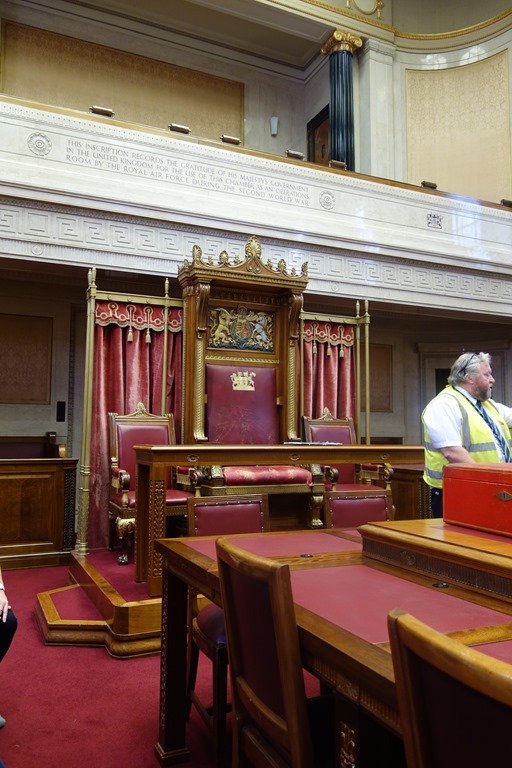 As the Northern Irish Assembly doesn’t have a higher House, the Senate chamber is now used as a committee room. There are two notable painting hung in the room. 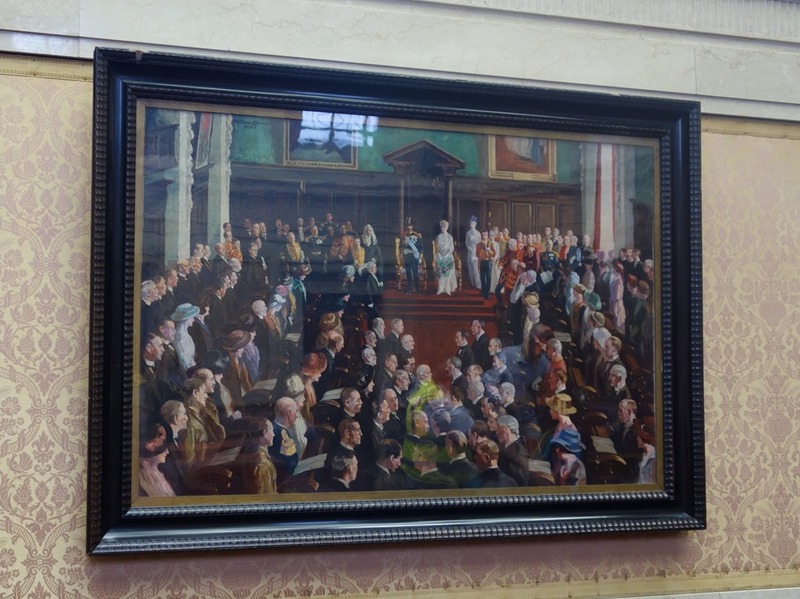 One by William Conor of the opening of the Northern Irish Parliament in 1921 which took place in Belfast Town Hall. The other is by Belfast artist Noel Murphy. ‘The House will Divide’, shows all the Members elected in 1998 to the Northern Ireland Assembly. There were several well known faces – in the painting, that is. 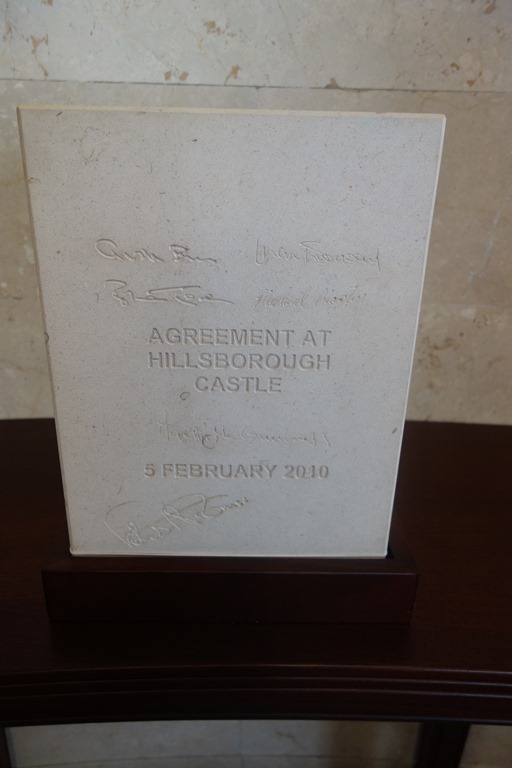 In the ante-room, this sculpture commemorates the historic Hilsborough agreement, that allowed the devolution of policing and justice powers to the Northern Ireland Executive. 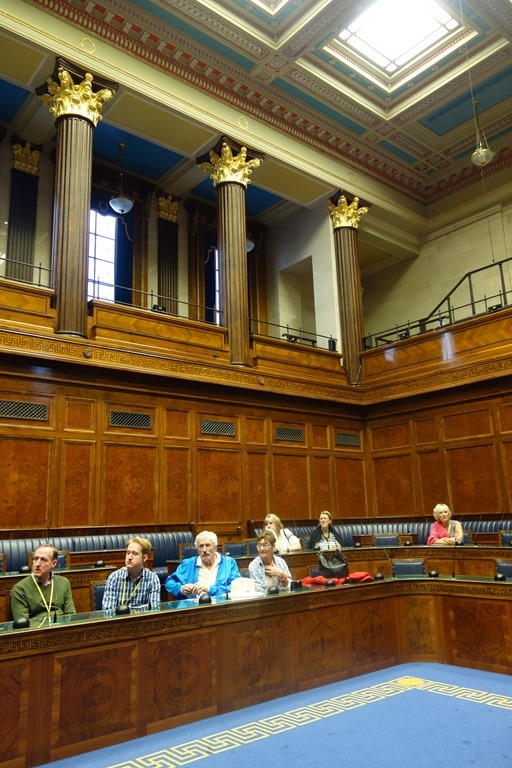 It’s much more modern than the Senate chamber, having been reconstructed and refitted following a major fire caused by an electrical fault, on 2nd January 1995 which destroyed the Assembly Chamber. 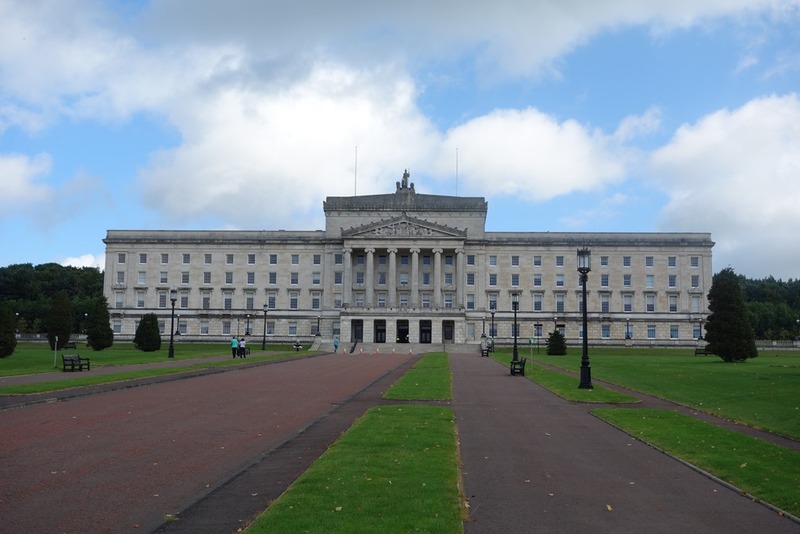 There are 108 Members of the Legislative Assembly (MLAs), 6 from each of the 18 electoral constituencies in Northern Ireland. 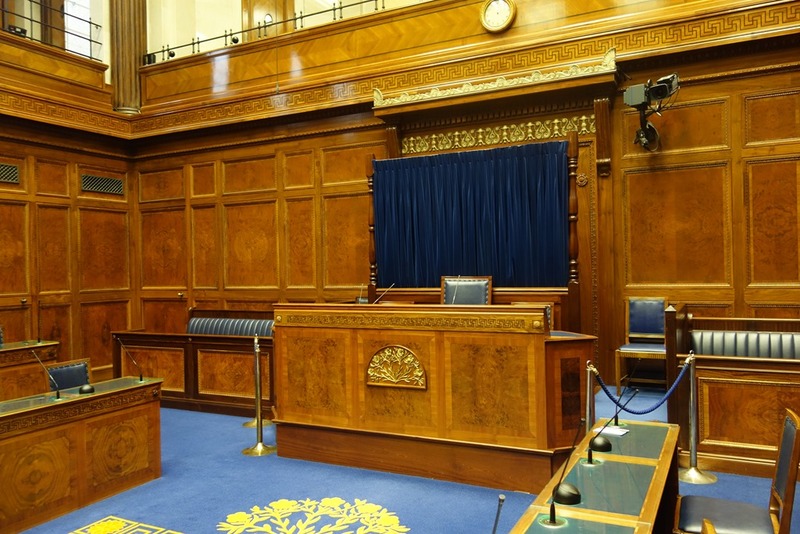 Unlike Westminster where the Government and Opposition face each other in the Northern Irish Assembly chamber a Scandinavian model has been used with the benches in a horseshoe in an attempt to reduce adversity and conflict. 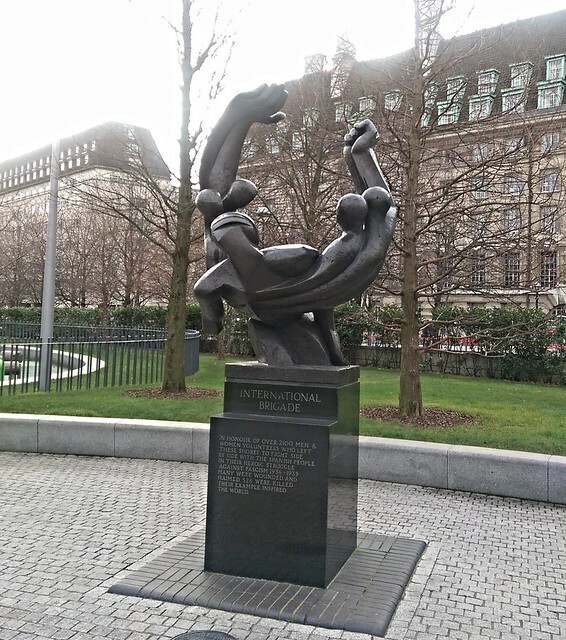 This monument to the British Battalion of the International Brigade that fought for the Republican Government against Franco’s Fascist uprising, stands in Jubilee Gardens on the Southbank in London, near the old City Hall and the London Eye. 4.5 metres high, it portrays four figures supporting a fifth wounded and kneeling figure. 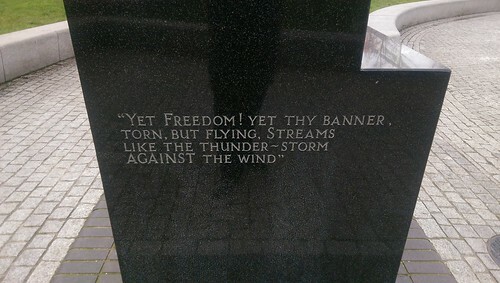 It was sculpted by Ian Walters, a Socialist who also created other memorial sculptures, including the statue of Nelson Mandela, not far away across the Thames in Parliament Square. The International Brigades were a group of idealistic young adults who left their homes and families and risk death to fight for a cause they believed in. Some may see parallels with those travelling to Syria to join the so called “Islamic State”. But the International Brigade volunteers were going to fight to defend a legitimate government threatened by fascists, while those travelling to Syria today are supporting an organisation commiting atrocities, which has much in common with the most viscious Fascist regimes. I have a personal connection with the International Brigade as a relative, Will Paynter, my Granmother’s cousin, an activist in the National Union of Mineworkers and the Communist Party, was involved in the recruitment of men to fight for the Brigades in the Spanish Civil War. In March 1937 he was sent to Spain to look after the interests of the British Battalion. It must be clear to every delegate in this Congress that the issue in Spain is one of which the outcome will not only determine the destinies of the people of Spain; it must be clear to everyone that the outcome of the conflict in Spain will involve the destinies of the people of all countries…. The conquest of Spain can well mean the commencement of further attacks upon other European democracies, and therefore I am pleading with this Congress that we should regard this matter not merely as one of solidarity, but as an issue of self-preservation for our trade unions in this country. 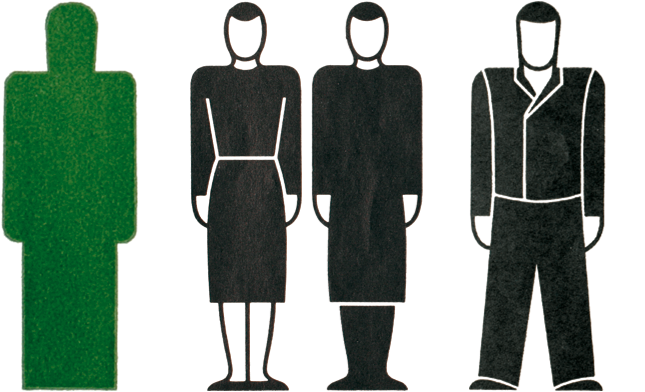 While visiting the Art Turning Left exhibition at the Tate in Liverpool last week, I was particularly taken by a small number of simple wood cut prints with a political message by the German artist Gerd Arntz. I’d never heard of him before, but, curious, I decided to try to find out more. Although he was born into a wealthy family, he became a committed socialist. Moving to Dusseldorf in 1919, and the year after he joined the Cologne Progressives, a group of Communist artists based in Cologne and Düsseldorf. He was a “council communist” who advocated the formation of worker’s councils, like the Soviets that preceded the Russian Revolution of 1917, to replace the existing state apparatus. He created woodcuts for the ‘Allgemeine Arbeiter Union’ (General Labor Union) as well as the Communist ‘Intenationale Arbeiter Hilfe’. In 1925, he took over Otto Dix’s studio in the city. Throughout his life, he specialised in producing woodcuts and linoleum cuts, criticising social inequality, exploitation and war – a technique that allowed reproduction and widespread dissemination of images for propaganda purposes. His prints were exhibited, sold to sympathetic art lovers, and published in left wing magazines.There’s a good selection of his images here. 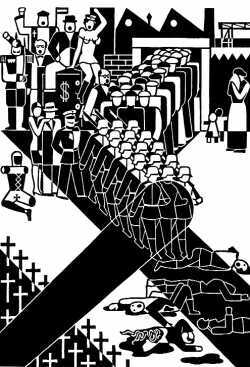 In 1926 he was recruited by Otto Neurath to design pictograms and further develop ISOTYPE – the International System of Typographic Picture Education –at that time, a revolutionary approach to communicating complex information using symbols. 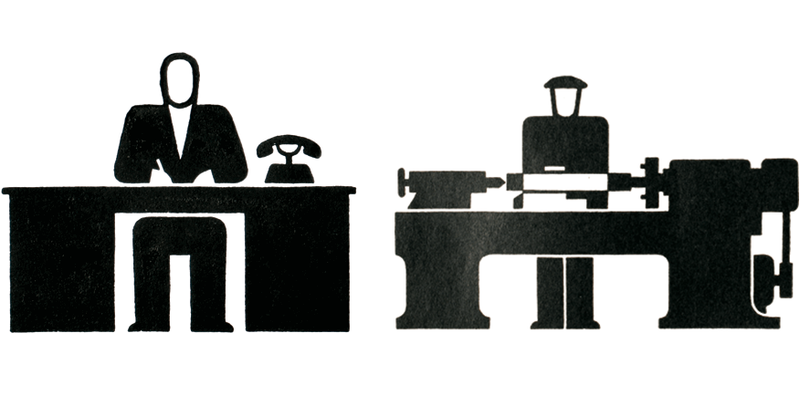 From the beginning of 1929 Arntz worked at the Gesellschafts- und Wirtschaftsmuseum (Social and Economic Museum) directed by Neurath in Vienna, and designed around 4000 pictograms which could be used to symbolise key data from industry, demographics, politics and economy, transcending language barriers. 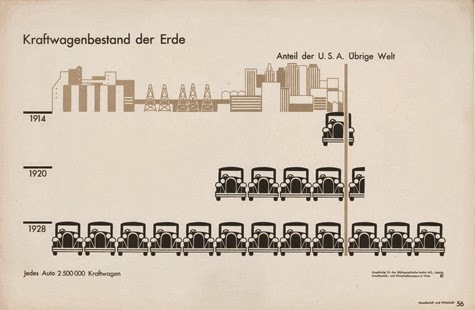 In 1930 they produced the Atlas Gesellschaft und Wirtschaft a statistical atlas on society and the economy with charts and diagrams using the pictograms. "Numbers of motor vehicles in the world" (USA and rest of the world). 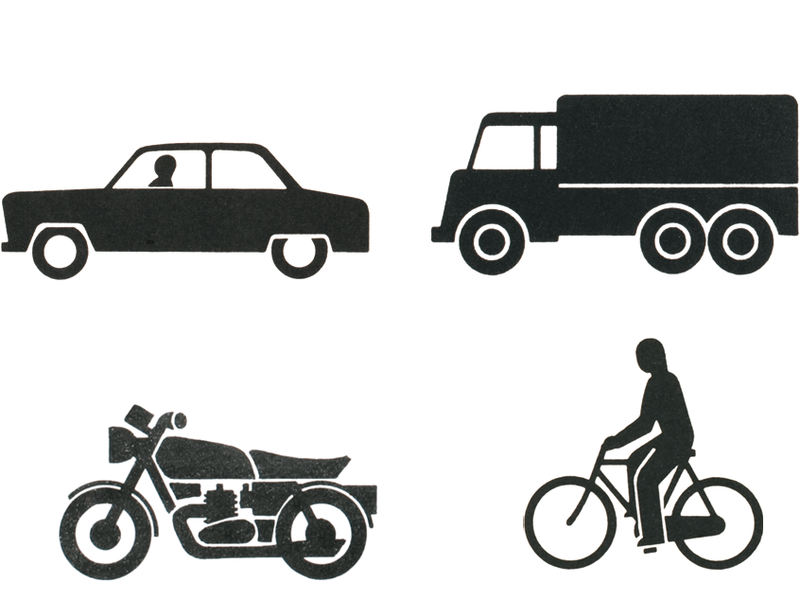 A selection of around 600 of Arntz’s pictograms are available on-line at the Gerd Arntz web archive website. Here are a few examples. 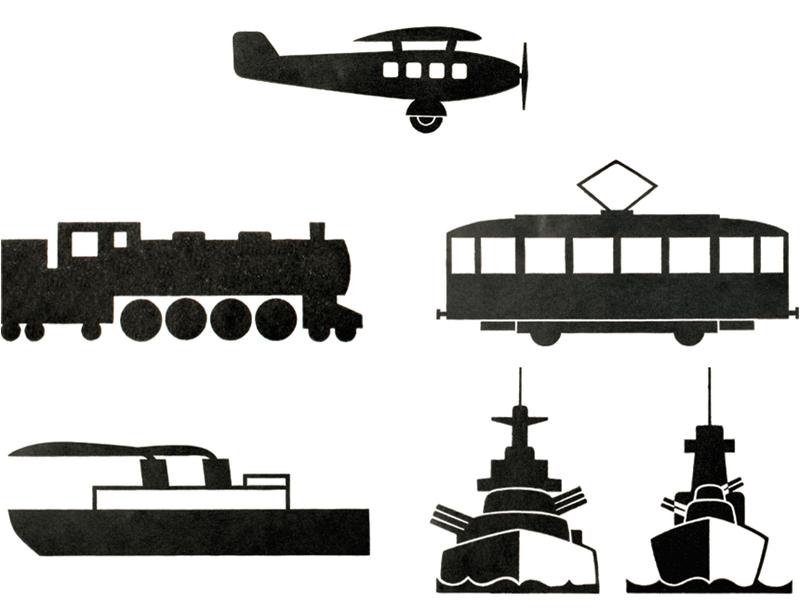 Today these symbols and pictograms have a very familiar look. Just check out your clip art collection or look at the icons used on your phone, tablet and computer. Similar symbols are used in all sorts of applications, including representations of statistical data. But in the 1930’s they were revolutionary, from both an artistic and political perspective. In 1934, Arntz fleeing the fascist regime in Austria, emigrated to The Hague, and in 1934, he published a series of prints warning against the danger of Nazism. In 1943, after the German invasion of the Netherlands, as a German citizen Arntz was conscripted into German military service, but deserted to the French Resistance in 1944. After the war he moved back to the Hague and continued to work as a graphic designer. He also remained a committed socialist to the end of his life in 1980. There was a new comedy programme that started on BBC last week, written by Ben Elton. It’s all about Gerald Wright, a Health and Safety Department chief from the fictional town of Baselricky, somewhere in the south of England. Very funny I’m sure – except it isn’t and it’s had a real panning from the critics. But the premise that it’s hilarious to make fun of people involved in protecting people at work from accidents and ill health has become generally accepted. In recent year the trend in the media and the entertainment industry has been to mock, misrepresent and ridicule the whole idea of health and safety. This has played into the hands of a government which has an ideological agenda to remove anything that gets in the way of the pursuit of profit. 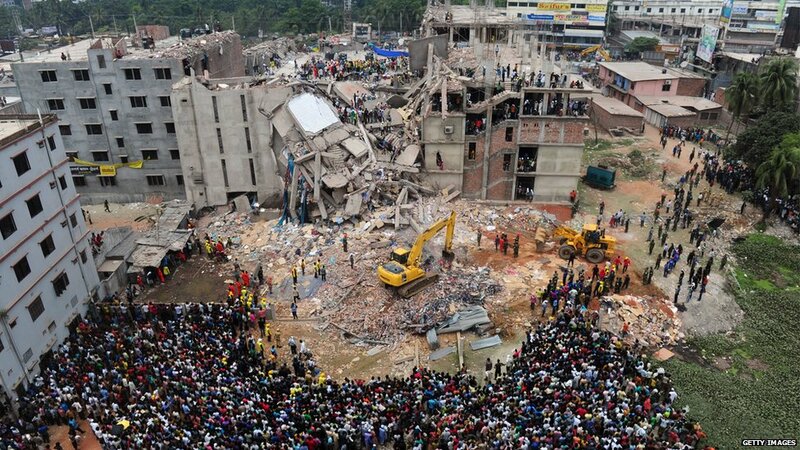 the collapse of a building in India which resulted in the death of a large number of Indian textile workers. Ben Elton, who made his name as an “edgy” radical comedian really ought to know better. 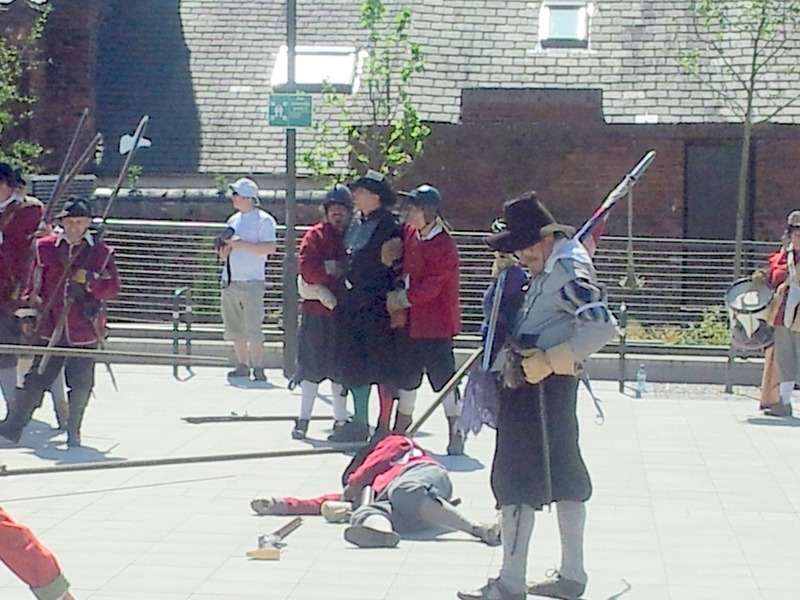 The Manchester International Festival is held every two years in July. Unfortunately, it inevitably coincides with my summer holiday so although it usually includes a number of events I’d like to attend, I end up missing out. One event I’ll be sorry to miss this year is the performance of Shelley’s epic poem “The Masque of Anarchy” by Maxine Peake. 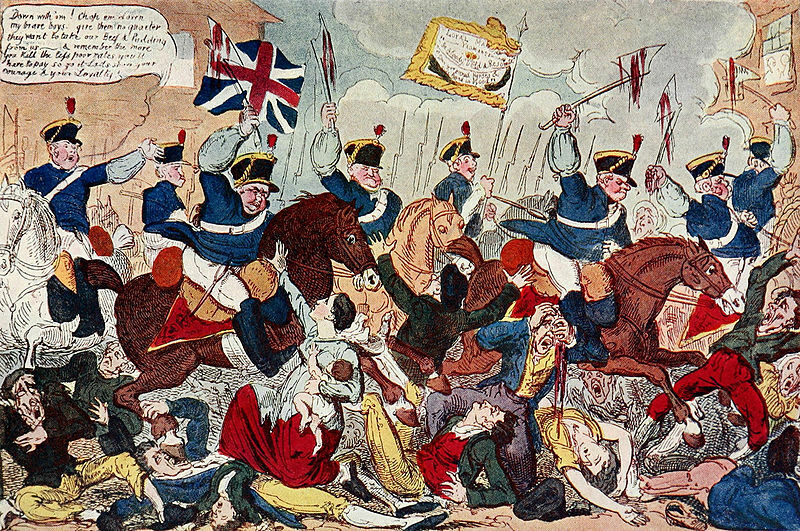 A ballad with 38 verses, Shelley wrote the poem on 5 September 1819 when he was living in Leghorn in Italy in response to the news of the “Peterloo massacre” (also known as the Battle of Peterloo) that took place in Manchester on 16 August of that year. 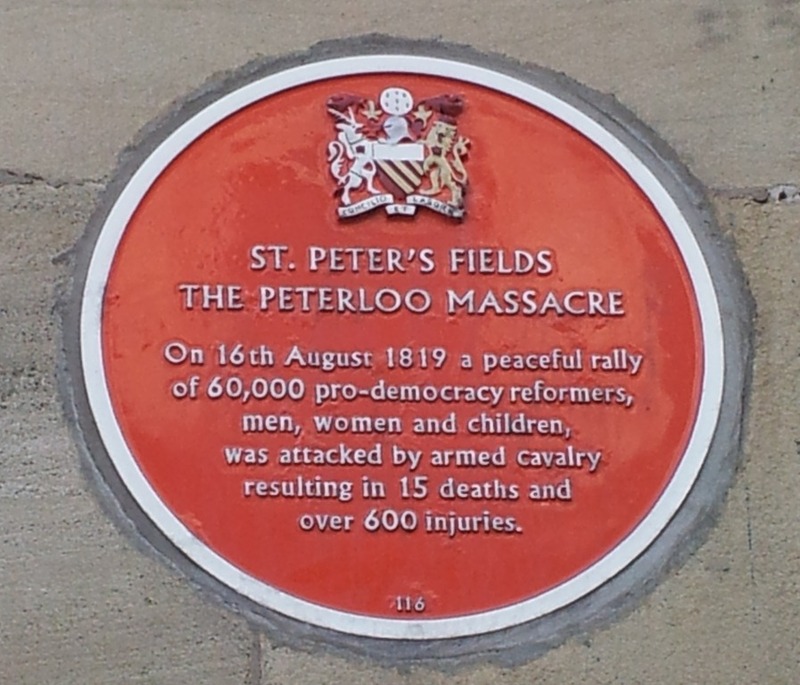 Fifteen people had been killed and a large number seriously injured (estimates vary, but there may have been as many as 700) when the Yeomanry cavalry (mainly volunteers from the upper classes) charged into the crowd at a large peaceful demonstration and meeting of some 60,000 people organised by the Manchester Patriotic Union, a group agitating for parliamentary reform, which was addressed by the well-known radical orator Henry Hunt. 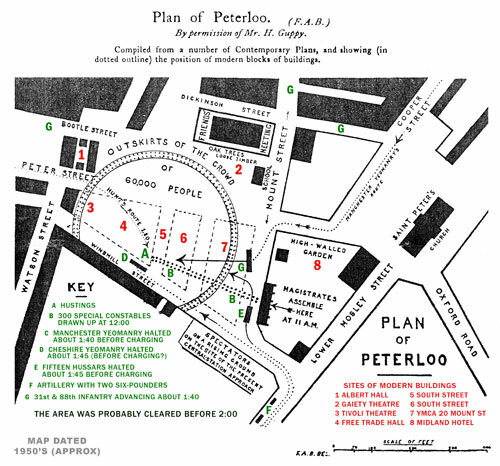 The events took place on what was then the open land of Peter’s Field, now a built up area in the city centre around the former Free Trade Hall. The ruling class used the event as an opportunity to attack the reform movement. Viscount Sidmouth, the Home Secretary, sent a letter of congratulations to the Manchester magistrates for the action they had taken. Parliament also passed the Six Acts in an attempt to prevent such meetings happening again. The organisers were put on trial, being charged with “assembling with unlawful banners at an unlawful meeting for the purpose of exciting discontent”. A number of the leaders, including Henry Hunt were found guilty and jailed. 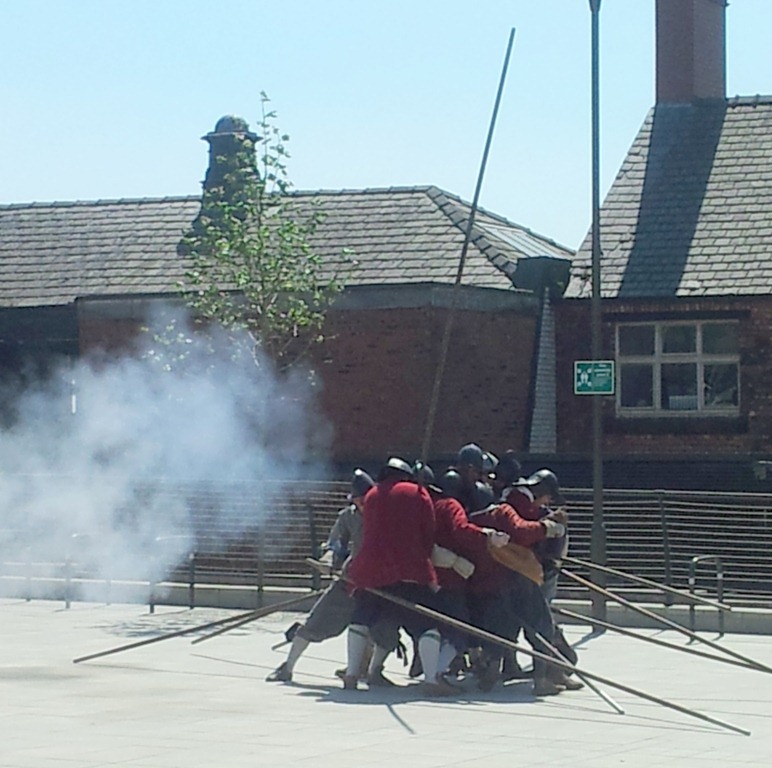 So in the short term, the events on the 16th August were a setback for the reform movement. 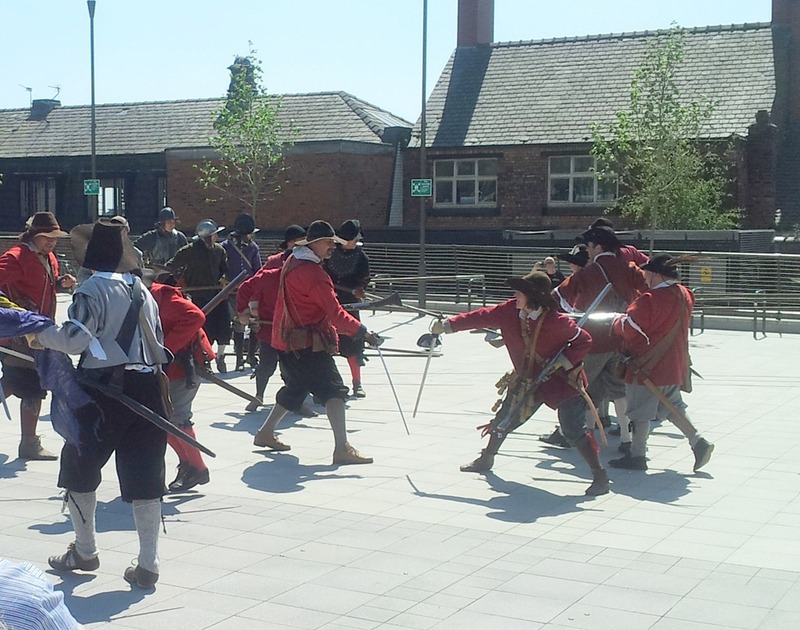 But it’s legacy endured and today Peterloo is remembered as one of the pivotal events in the struggle of working people to achieve the vote and improve their lot. 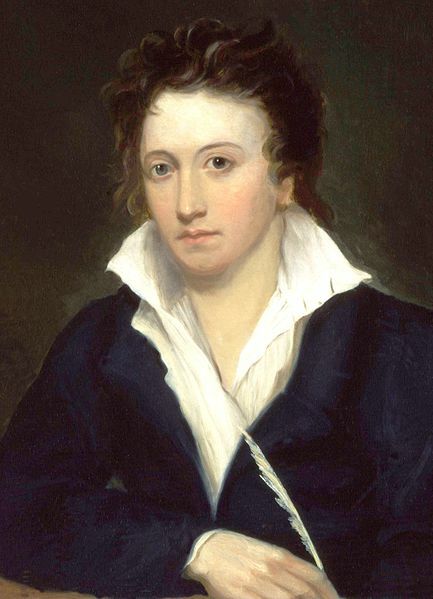 It isn’t his best poem, but it’s one of his most stirring, demonstrating Shelley’s raw emotion, passion and commitment to the rights of ordinary people. It remains one of the greatest political poems in the English language. 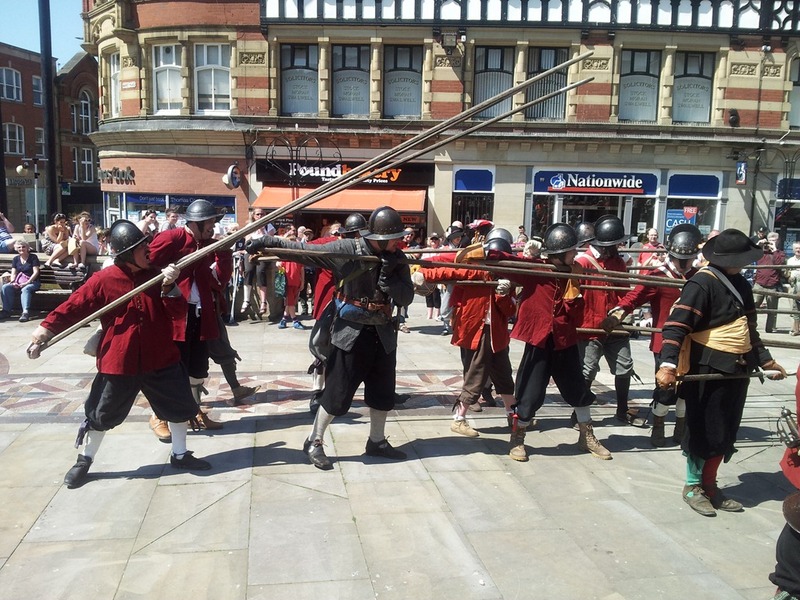 In August 1651, King Charles II arrived in Worcester with a mostly Scottish army and summoned all royalists to join him against the new republican government of Oliver Cromwell. 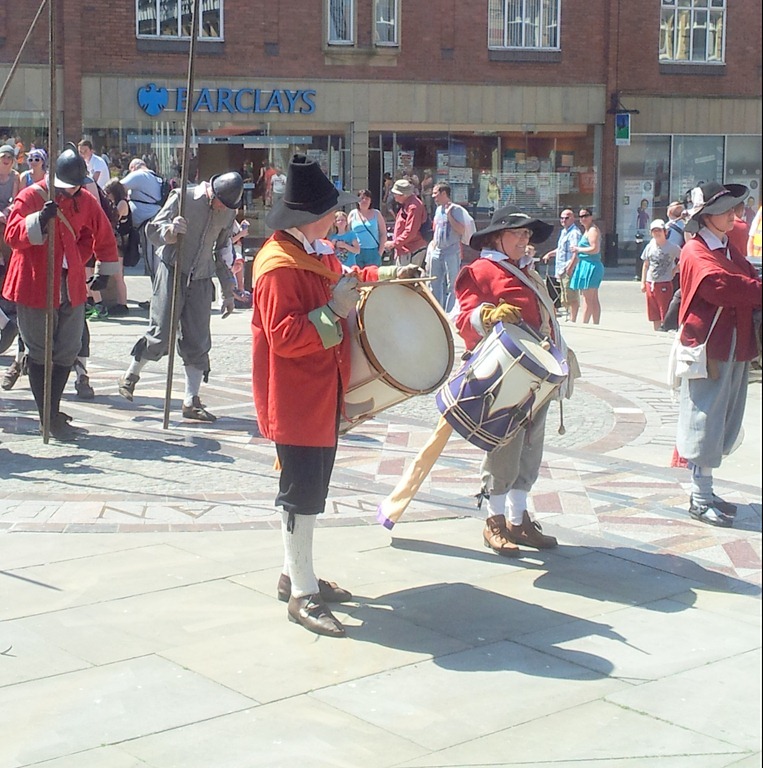 The Earl of Derby raised about 1,500 royalists in Lancashire and the Isle of Man and set off south. 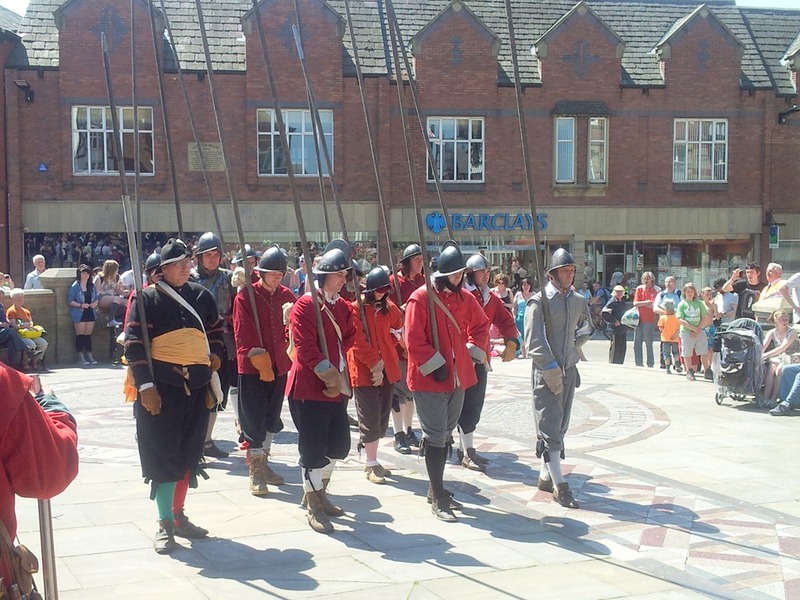 The Earl was met at Wigan on 25 August by the parliamentarian army of Robert Lilburne, who had about 600 infantry and 60 dragoons, but who was expecting another 3,000 men to arrive very soon……..
……….. 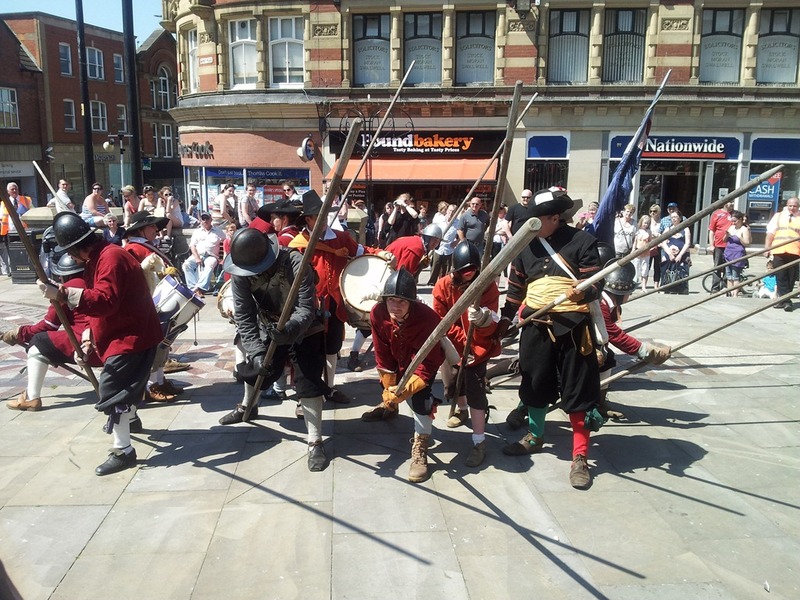 The defeat of the royalists at the battle of Wigan Lane cut off the supply of volunteers going to join Charles II at Worcester and ensured that he would be heavily outnumbered when confronted by Cromwell a few days later. And indeed on 3 September Charles was crushingly defeated. 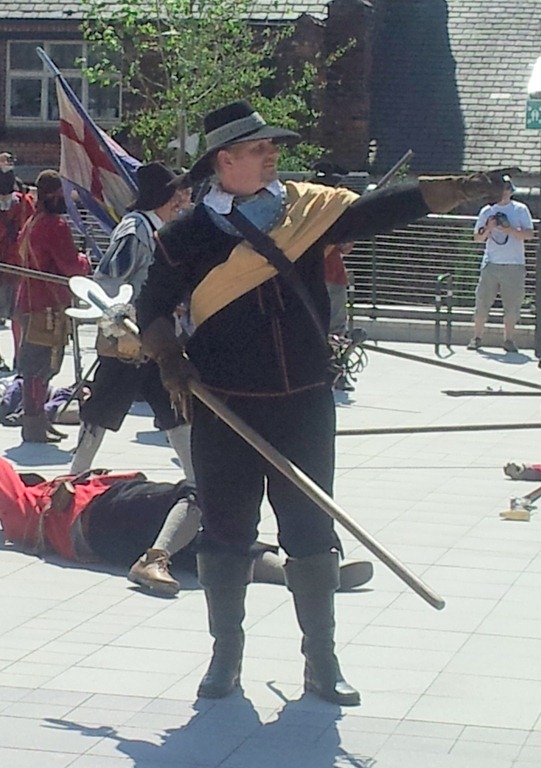 The Earl of Derby was wounded, but escaped. 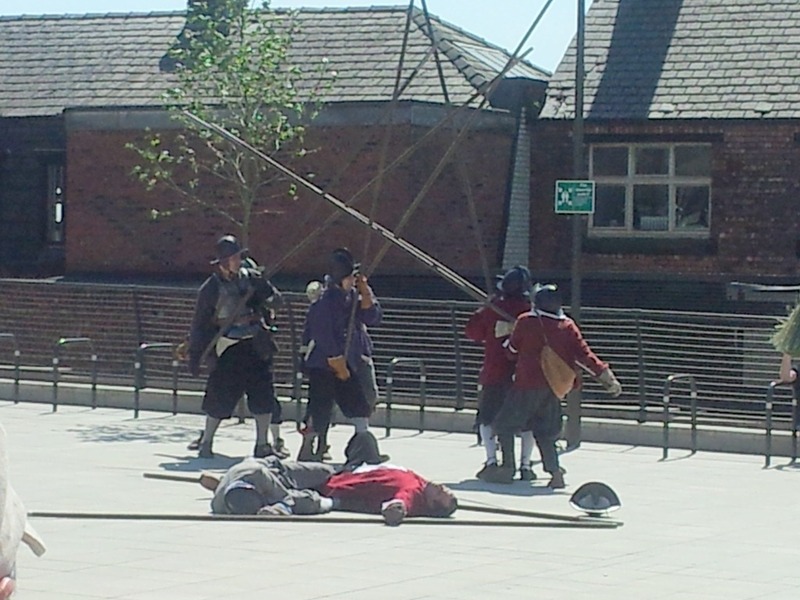 His major General, a member of the local gentry, Sir Thomas Tyldesley, was captured and executed. 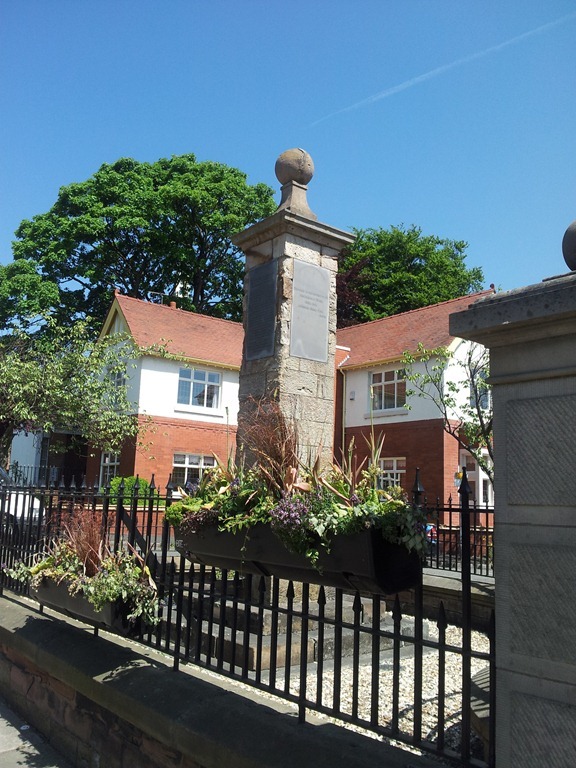 A monument in his memory was erected on Wigan Lane in 1679, and still stands today on the corner of Monument Road. 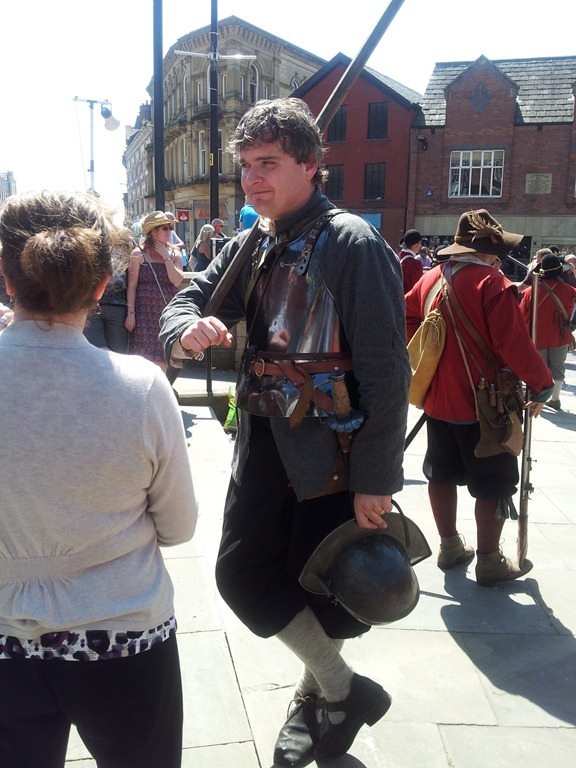 and mingled with the crowd, answering questions about the Civil War, the troops, their costumes and their weapons. 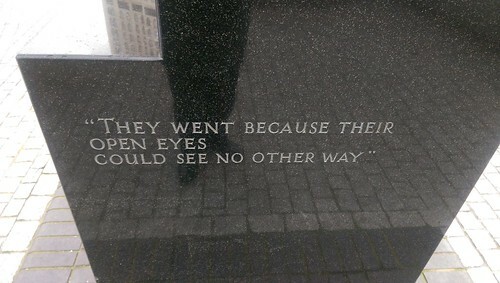 and then executed by firing squad. 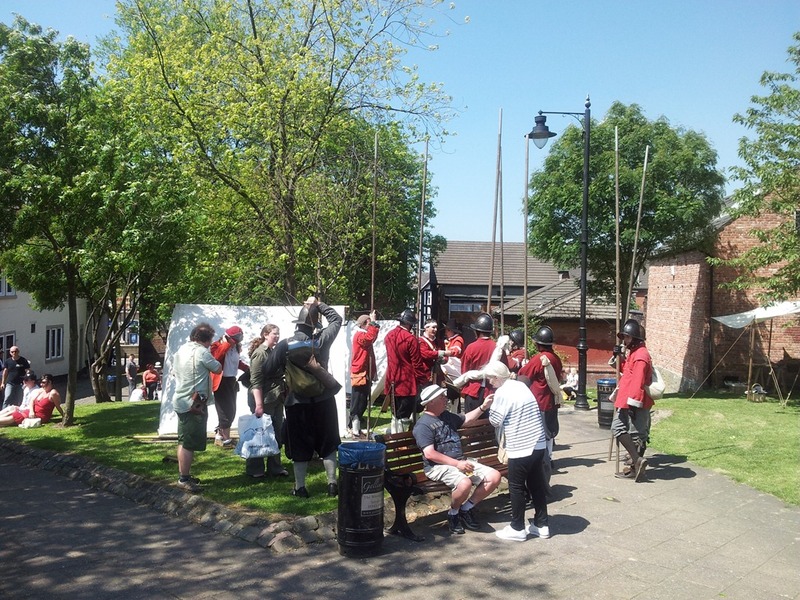 During the Civil War Lancashire was very much a rural backwater under the dominance of the feudal lords who formed the backbone of the King’s supporters. 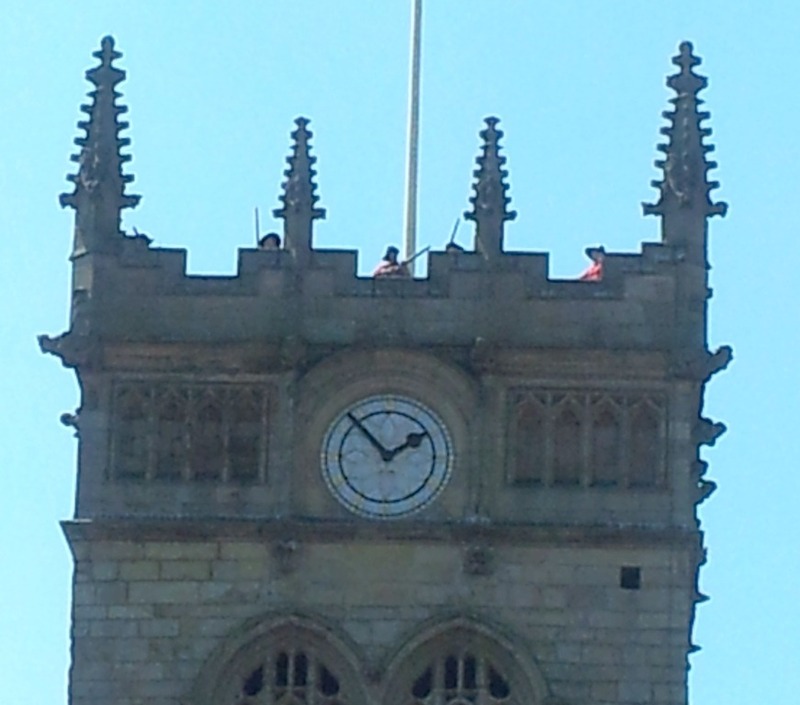 There were some towns, like Bolton, which were Parliamentary strongholds, but Wigan was stoutly Royalist and the town’s motto – “Ancient and Loyal” – was allegedly awarded by the king in recognition of this support. 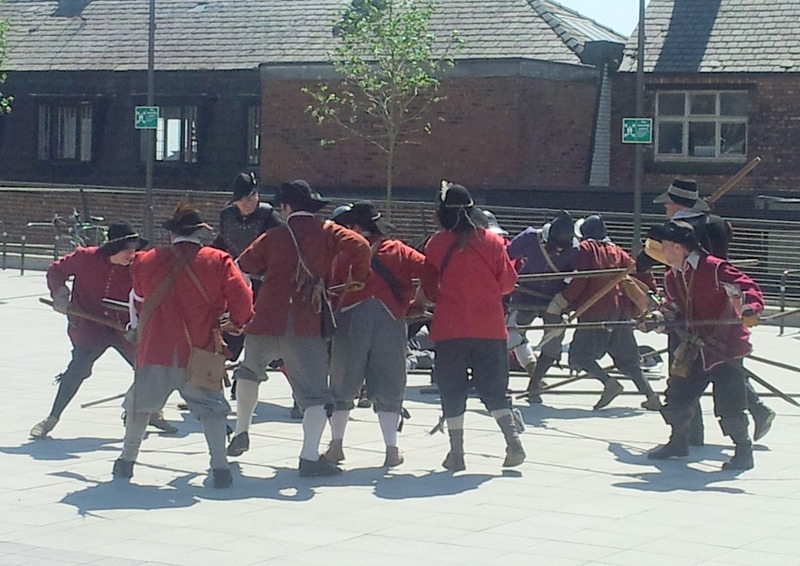 Despite this Wigan was the home town of Gerard Winstanley, leader of the Diggers one of the most radical movements to emerge during the Civil War. 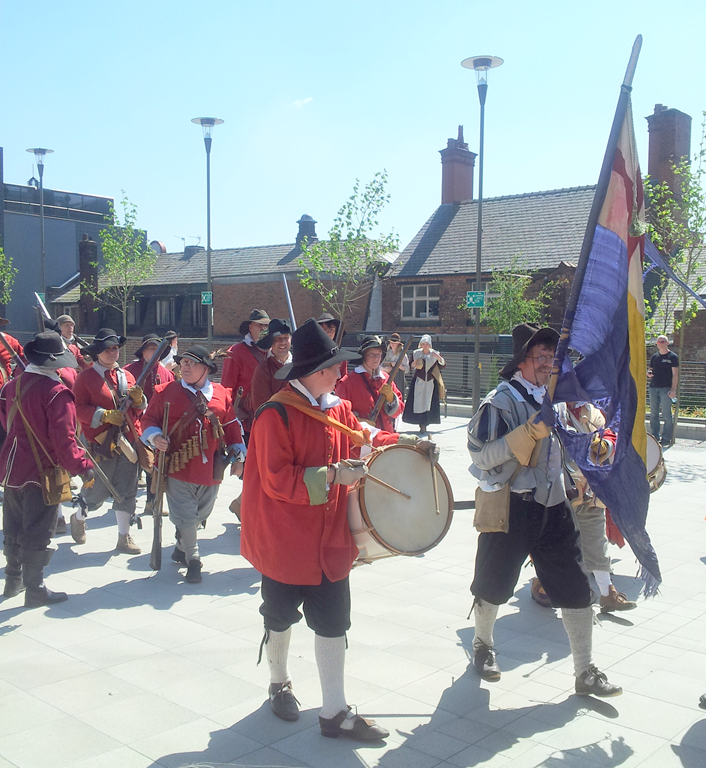 Today, the popular sentiment is pro-Royalists, based on a simplistic, romantic admiration of the “Cavaliers”. 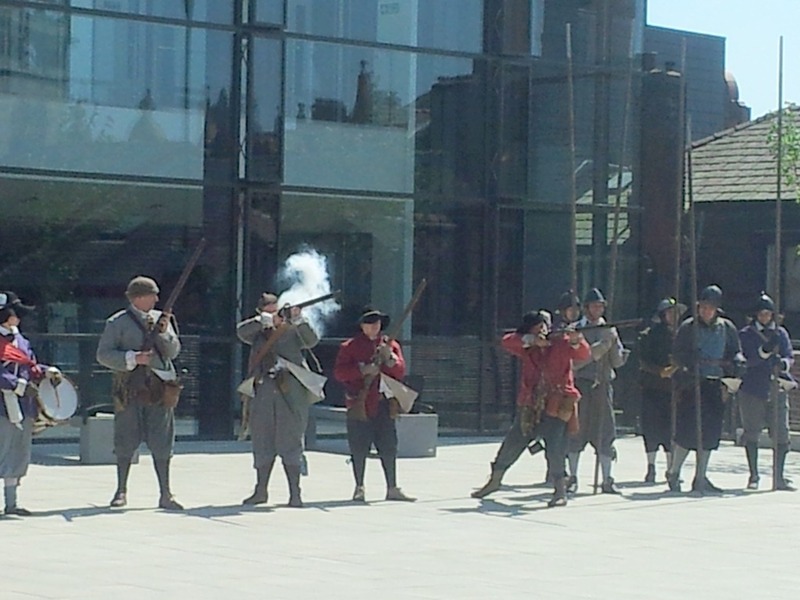 And that was reflected by some cheers amongst the crowd for the Royalists . 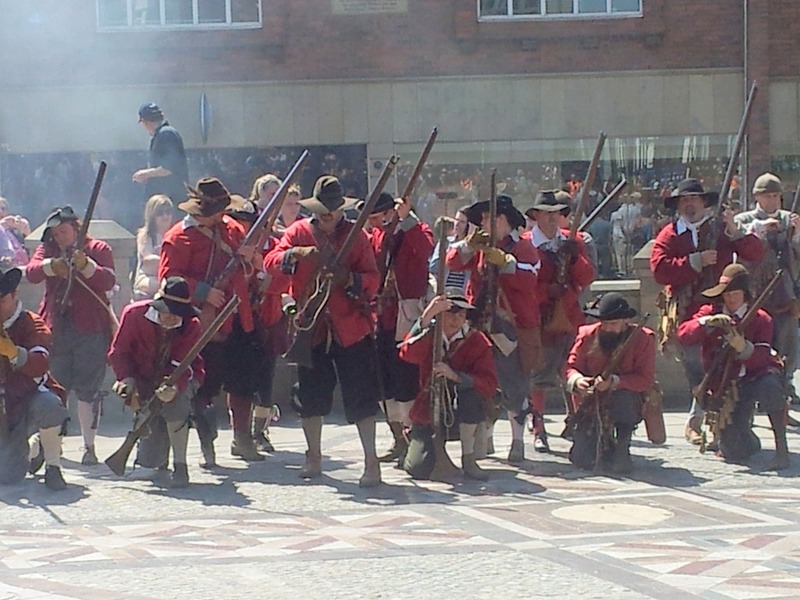 Personally, my sympathies lie unreservedly with the “Roundheads” and the Levellers, the radicals in the New Model Army, led by men like John Lilburne (Robert’s Brother) and Thomas Rainsborough, and the Diggers. No “divine right of kings” for me, where everyone knows their place and thanks God for it. Without the victory of the parliamentary forces, England, and Britain, would have remained a feudal backwater. And the Levellers and Diggers are part of a true radical tradition that laid the foundation of the democratic rights we hold so dear today.